Hi, Linda! So glad to have you with us today! Linda Boulanger is a happily-ever-after author, wife, and mother of four human children and two fur babies. 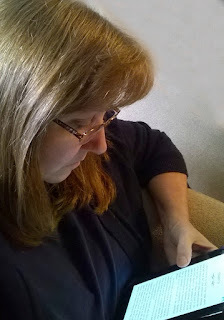 She has an eclectic mix of published books, numerous story singles and short stories in a few group anthologies, plus a slew of always evolving works in progress. Castles and swords, lord and ladies, and men that turn into… dragons? When modern-day Luke Tavish found himself in an ancient world, he had to come to terms with the fact that he was more than just a man. Even so, if he hadn’t been so concerned about his family, Luke could have learned to enjoy the place, especially the fair maiden whose mere touch had sent them flailing through time. One thing was certain, she wasn’t your typical Medieval Lady. He’d almost laughed when he’d been told that all he had to do to “unlock his powers” was to sleep with the beauty. Only it wasn’t that simple, as he would find out. A dragon’s heart belonged to his mate for life, and that got complicated when their lives were six hundred years apart—especially when Luke began to feel the future calling him back. But what about Amileigh? What would happen to her when the hands of time began to spin once more? Could he ask her to go with him? Would she even say yes if he did? Fate’s web was about to be tested and it would all come down to human will, a kiss, and the flip of a very special coin. Linda is such a treasure. Go and check out her books, they are incredible! Wow! I had no idea what was behind this nursery rhyme. Welcome, Linda! Thrilled you could join us. I'm an admirer of your beautiful covers. Thank you so much, Joanne! I'm very happy to be here and am glad to hear that you enjoy my covers. It's been a dream come true to not only pursue the writing, but to also have the opportunity to work with amazing authors from around the world with cover designs. I'm one of the lucky people who can say I love my job! Today on #OurAuthorGang, our guest is author Linda Boulanger . Dragons!!! Yay! Welcome, Linda, and thanks for being our guest today. Thank you, Patrick, for your nice words here and for giving me that little shove that got me started writing again. Always busy! Sometimes writing ;-) Since most of my stories get their start in NOTES on my phone, I can't really blame a busy summer schedule for not getting quite as much done, thought I will try to pin the blame there. I have works in progress on each Book 2 in my series (what is the plural of series), and on Book 3 of this series... that book is titled On Wings of Courage, featuring the oldest brother, Seth. He's scrumptious, just sayin'. I just love this woman and love all of her books. She also designs the most gorgeous book covers. I so loved this book too! Thank you so much, Erika! I'm happy to be here. Hi to one of my favorites!! You know I'm with ya all the way!!! Thank you so much, Mary! I hope you enjoy reading it as much as I did writing it. Hello Linda! My your cover is striking and I love the Medieval time period as a setting for books. Your twist - the dragon - is quite clever. I really want to read your book. I'm glad you got a copy! On Wings of Time was originally part of Stoking the Flames 1, and each story had to have some sort of dragon lore. Since I also love the Medieval period, I chose to have my modern day man go back in time to that period. It felt "right" and it allowed me to have some extra fun and exploration with the cultural differences. In Book 2, On Wings of Fire, the male character goes back to the Georgian time period of the heroine. That was uncharted territory for me, but I thoroughly enjoyed all the research and learning, and getting to share it all from the perspectives of my characters. Still, Medieval-esque is my favorite. Thank you so much for having me here. 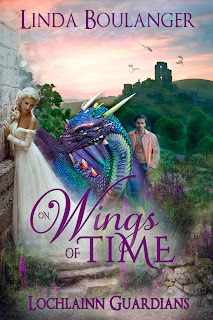 On Wings of Time is a personal favorite and the first story in my Lochlainn Guardians Series (though each book is written to be able to stand alone as well as being a part of a bigger picture). Book 2, On Wings of Fire, is currently part of the Stoking the Flames II Anthology, which I forgot to mention in the interview. Welcome. It's always fun to meet a new author. Thank you! I always enjoy meeting new people as well. So glad to have you here spotlighting your book. I love this story. So glad our paths have crossed. Thank you so much, Grace. I'm beyond happy that our paths crossed as well. I love discovering new authors. Her Wings of Time sounds very intriguing and I am adding this to my 'To Read' list.